We only use the best Organic flour, milled by Shipton Mill where their flour has been stone-ground since the Doomsday book. Sea salt, filtered water and quality organic ingredients ensure that the bread you eat is of the highest quality. All our loaves are suitable for Vegetarians and Vegans and our Gluten free bread is exceptional! Our reputation for brownies shows no sign of slowing and you will always find a few of the following to spoil yourself with...Lime & sea-salt, Blackcurrant & Cassis Cheesecake, Raspberry & White Chocolate, Peanut Butter or try the original brownie all made with English Butter and 70% Belgian Chocolate. All our pastries are handmade in the bakery, situated just at the rear of the shop, and baked throughout the day to ensure they are fresh and tasty. Cider & Apple, Cajun, Black pudding and Red Onion Relish are some of our most popular sausage rolls. Also in the summer we bake our famous Mack-a-Rolls; puff pastry filled with local smoked mackerel. At the rear of the shop is where everything happens! Our bakers work seven days a week to fill the shop with the aromas of freshly baked bread, cakes and savoury pastries. Just like our bread, our cakes and pastries embody the judges food ethic: Fresh, seasonal, organic and (as much as possible) locally sourced. 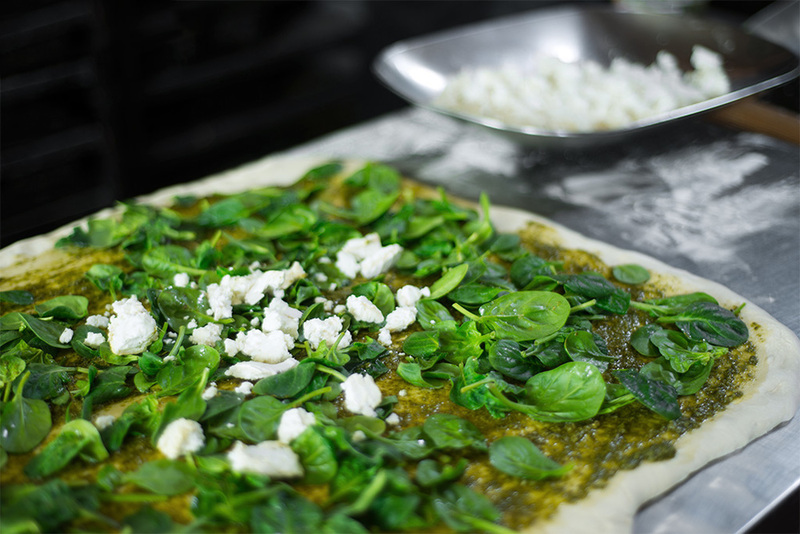 Everything is made from scratch, using the highest quality ingredients available. Inspired by a range of local and international influences, we strive for creativity and variety in our daily menu. Examples on offer daily include: Apricot & Almond buns, Chocolate Rye and Sea salt cookies, local Smoked Mackerel Quiches, Roasted Cocoa Cookies, Oat Orange and ginger Cookies, Rose & Pistachio meringues, Roasted Garlic and Onion swirls, Raspberry & Blueberry tarts, Garlic, fennel and Parmesan Sausage Rolls and always on the shelf are our famous Lime & Sea salt brownies. We also offer many wheat and dairy free options for those with a dietary requirement as well as a sweet tooth!